The Rare Plant Conservation Program at Bok Tower Gardens is committed to rare plant preservation. Conservation in Progress is a biannual summary posted on the Bok Tower Gardens website as a rare plant informational tool for website visitors. The genus Justicia is large, consisting of roughly 688 plant species which are found worldwide in mostly sub-tropical to tropical areas, and which are commonly used as ornamentals because of their showy, unique flowers. A perennial herb was discovered in Hernando County, Florida in 1950, and was given the name Justicia cooleyi after the explorer who found it, George Cooleyi. Numerous surveys have since located 17 populations of this species, but because of development and other threats, an estimated six populations may currently remain. Many varieties of Justicia have been brought into Florida over the decades because of their ornamental value, and because of the possibility they could escape and become naturalized in our landscapes, the flowers, seeds and pollen of J. cooleyi have been scrutinized to determine its taxonomic status to make sure it is not actually a similar species from south America, J. pringleyi. Although the scrutiny suggested they are distinct from each other, there were both similarities and differences between these species, so a further look was needed. The issue was important to resolve because federal and state agencies need to be informed as whether to put resources towards its preservation or towards eradicating it as an exotic to preserve natural habitats. In 2015-2016 we partnered with Dr. Carrie Kiel at Rancho Santa Ana Botanic Garden to look at the taxonomic placement of J. cooleyi using genetic methods. Leaf samples were collected from three disjunct populations in Hernando, Citrus and Sumter Counties, and DNA was extracted from each leaf sample. 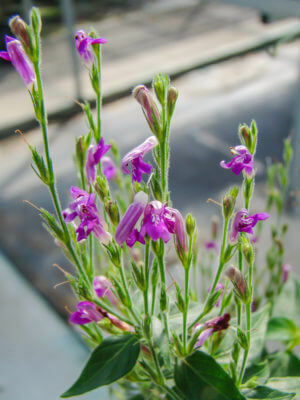 Three genes were amplified from each sample, sequenced, and aligned with sequences from J. pringlei and other Justicia species. The resulting phylogenic trees clearly suggested J. cooleyi to indeed be a distinct and separate species. Its closest relative was J. galapagana and not J. pringleyi. The data suggested that all three likely had a common ancestor 15-30 mya in Mexico or South America. Although representatives of many of the remaining genotypes of Ziziphus celata are present in the National Collection beds, several genotypes are not present. Plants found in the wild representing these ‘recalcitrant’ genotypes have been used in numerous cloning attempts for over a decade to preserve their unique genetic material. Cloning of this species is achieved by taking root cuttings to produce new individuals in the greenhouse, and some propagation has even been achieved through tissue culture. While these methods have been successful to produce new individuals of many of the wild Z. celata plants, there has been no success to date to clone plants representing those few missing genotypes. In 2016, we began propagation trials to explore whether this species can be cloned using aeroponics. Fresh growth was used to test whether apical cuttings can root and eventually form entire healthy plants. The use of several treatments, such as two types of auxins, a mycorrhizal inoculation and a low nutrient media, are currently being tested on the cuttings in a tabletop aeroponics unit. 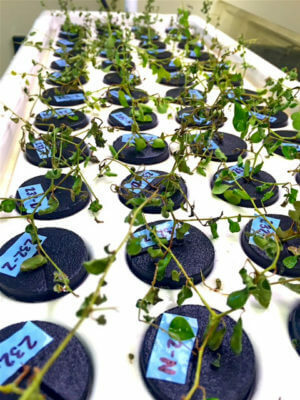 If successful, this propagation will allow for a much greater and more rapid ability to clone the Florida Ziziphus, and to finally bring those missing genotypes into the National Collection for preservation. To date, roughly half of the 48 cuttings in the trials have developed tiny roots, and in upcoming weeks they will be watch to determine if they can form healthy new plants. The very rare Ziziphus celata is found only in Polk and Highlands Counties along the Lake Wales Ridge in central Florida, and was once thought to be extinct. Work within the Rare Plant Conservation Program over more than two decades has allowed clones of most of its populations to be brought into the growing beds in the National Collection at Bok Tower Gardens. Because Z. celata is an obligate out-crosser, the mixture of genotypes from different populations at Bok Tower Gardens allows sexual reproduction to take place, unlike within any of the wild populations, where the individuals are too closely related to breed. Each year from May to July thousands of fruit are harvested from the plants in the National Collection. The fruits are sorted by mother plant, counted and then placed onto screen racks for drying. In 2016, new screen racks were specially designed for drying the Ziziphus fruit. The racks allow for maximum air flow to dry the pulp while protecting the seeds from numerous seed predators. 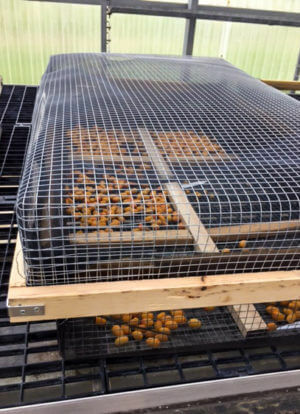 Each rack is constructed of welded steel mesh in a wooden frame with a similarly constructed fitted lid to prevent seed damage by rodents and insects. The lids are lined with window screening, which prevent the Pink Scavenger Caterpillar moth (Pyroderces rileyi) from laying its eggs on the seeds overnight, as the emerging larvae will feed on the embryo of affected seeds. Fruit collection began in May 2016 was completed in early July. A germination trial to compare viability across maternal parents and between harvest years will soon be set up using some of these seeds, and the rest will be secured into the National Collection for preservation. Ocala Vetch is an herbaceous, perennial vine which grows in sandy peat along the shoreline of natural springs systems in the Ocala National Forest. There are only three historically known populations of this species, and only two remain, the third having disappeared in 2003. Very little is known about this species, and its preservation into the future will likely depend on knowing its habitat requirements and its greatest threats, and using this information to find new, protected locations to introduce plants. Using seeds from all three populations that had been stored in the National Collection, we generated seedlings to use in a study to look at the genetic diversity remaining in the species and between the populations, using a fingerprinting technique called AFLP. This was a collaborative project between the Gardens and Dr. von Wettberg at FIU. The results showed very low levels of diversity remains in the species, and suggest the populations are overall genetically similar and probably were once connected. We also visited each of the three populations and recorded habitat data to learn what this species may need in its environment to thrive. A group of 14 volunteers kayaked and canoed the shorelines over two days collecting data within two-meter square quadrats, including percent leaf litter and associated vegetation. Findings suggest that the species persists best with the presence of sawgrass, wax myrtle and red maple, and cannot grow where oaks or water hyacinth line the shorelines. The most important factor for the species seems to be whether there is suitable substrate for fallen seeds to lodge and germinate. These findings suggest that determining the characteristics that constitute a suitable germination substrate for seeds of this species may be an important future project. 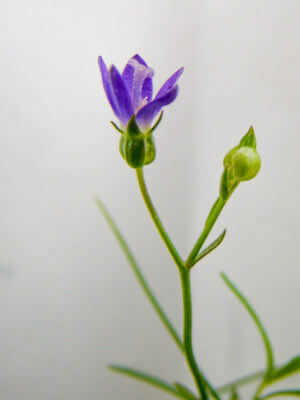 In January 2016, a project was initiated to look at the remaining genetic diversity within and between the remaining populations of the rare endemic Brooksville bellflower, Campanula robinsiae. C. robinsiae is a short-lived, very small annual which grows in wet mucky soils between the low and high water levels of ponds and ephemeral wetland areas. Up until 2007, this species was only historically known from three populations within a three-mile area of Hernando County. 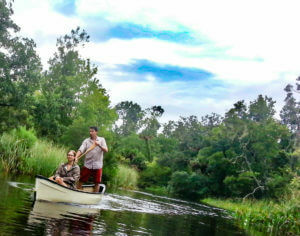 In 2007, a small population scattered among three adjacent locations was discovered two Counties away in Hillsborough River State Park. Two of the Hernando County populations are now lost, although BTG has seeds of one of these preserved in storage. This species is very vulnerable to changes in hydrology and has disappeared for two years in a row when winter rainfall has been either very high or very low, leading to either flooded or dried up pond margins. Preservation of this species will require knowledge of many of the poorly-understood aspects of its biology, in order to preserve remaining populations and create new populations on protected land. One of the most important aspects to understand is if the remaining populations are genetically unique. In April, DNA was extracted from fresh seedling tissue from three populations. The DNA was used to amplify the internal transcribed spacer (ITS) DNA region that lies between the genes for the subunits that make up the 18s ribosome. This region of DNA is often used to investigate genetic diversity within a species because its sequences can be highly variable between individuals. The amplified DNA samples are currently being used for a DNA fingerprinting technique called RFLP (Restriction Fragment Length Polymorphisms), which uses enzymes to cut the DNA into fragments of various sizes, based on the DNA sequence. Genetically similar individuals should generate similar fragment sizes, while unique individuals will have unique banding patterns. Understanding the genetic diversity of C. robinsiae populations will help address several key issues important to conserving this species, such as is determining the best source of seeds to use for new population introductions and to augment existing populations. Conservation and construction interests must work in cooperation for future generations to enjoy the benefits of healthy communities, which will need habitats that are functional and biodiverse. We engage in numerous partnerships with corporations and developers to restore and maintain habitat and species within areas impacted by construction and development. 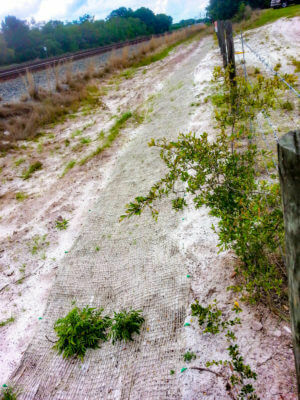 A current project involves restoration of Scrub habitat along a railroad right-of-way that had been leveled by railway expansion. With support from CSX Transportation, Inc. and other project partners, we are working to shovel away fill dirt to expose the buried, natural Scrub soil, have laid erosion matting along some of the planting areas, and are currently propagating over 300 plants of five listed species from seeds and plant collected from the site prior to the construction. Additional site preparations are taking place, and plants and seeds of these species, including Scrub lupine, are being experimentally re-introduced into prepared locations along the restoration area. The Scrub lupine population along this right-of-way once contained dozens of adults and could generate hundreds of seedlings. We are working to restore a healthy and self-sustaining population of Scrub lupine to this site once again, along with its community of numerous other listed and native plant species. The rare Clasping Warea, Warea amplexifolia, is endemic to the rolling Sandhills along the Lake Wales Ridge from Polk County to Marion County. It is also one of the rare species experience an alarmingly rapid loss of populations due to increased development in these areas. In a race against time to understand and preserve this species, we have been engaged in long-term, ongoing projects designed to understand its reproductive biology, regularly track the status of remaining populations, restore its habitat, and introduce new populations onto protected lands. A current project involves the first phase of establishing this species within Lake Louisa State Park. Prior to being a park, this area was once Sandhill habitat, but was privately owned and had experienced lack of land management and numerous impacts. Once preserved as a Park, land managers have been working hard to restore it to healthy Sandhill for the benefit of ecosystem and biodiversity preservation, and the enjoyment and education of Park visitors. In early 2016, two locations within the Park were selected for an experimental introduction of Clasping Warea. A timeline and plans were outlined with Park managers and biologists, and a germination experiment was performed in the greenhouse at Bok Tower Gardens. The germination experiment was designed to test for factors which may influence seed germination in the wild, and generated over 1,200 seedlings. 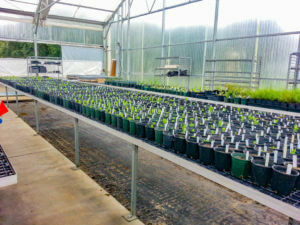 Roughly 600 of these seedlings are being prepared to be the first Clasping Warea to be introduced into Lake Louisa State Park in the summer.